Company: Coggins Promotional Advertising, Inc.
Coggins Promotional Advertising has been providing a complete B2B online company store solution since 2001, enabling companies to sell branded merchandise to employees and outside parties alike. Through advanced software, technological capabilities, and its company-owned fulfillment and distribution centers, Coggins lets companies control the brand, control spending and get the most out of every promotional merchandise dollar. Coggins came to LyntonWeb to shift the focus from a merchandise supplier to a full B2B partner for setting up an online store platform. The company wanted to re-establish its brand presence, then iterate and test from there – all with the overall aim of increasing conversions. 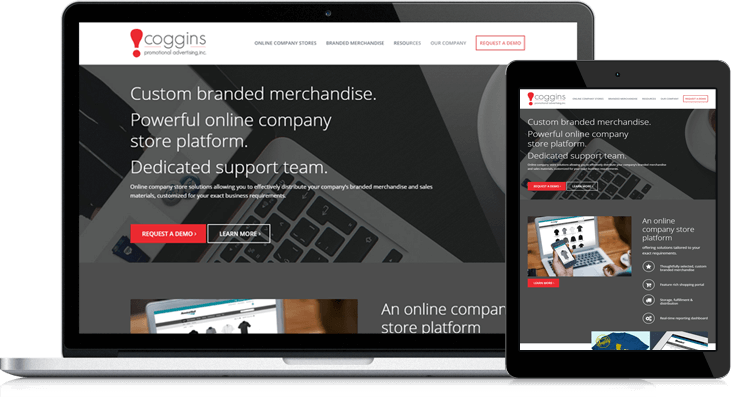 The redesign was aimed at showcasing the full scope of Coggins’ online stores solution, with in-house services most competitors can only offer through third party vendors. Coggins wanted to attract HR or branding departments that needed help executing branded merchandise, from brainstorming to acquisition to fulfillment. LyntonWeb got to work building a new site on the WordPress platform with embedded HubSpot forms. The redesign went quickly, with a launch within 60 days. In addition to a modern site with streamlined content and a focus on conversion points, LyntonWeb continued to provide post-launch assistance with page testing and optimization. Test results led to additional site enhancements, all geared toward core users. LyntonWeb also helped with blogging as well as encouraging Coggins to release more case studies, specifications documents and other content to draw in new leads. The results have been significant. In the six months following the launch, website traffic more than tripled from 942 to 3,092. The average conversion rate hit a solid 1%, with additional testing, optimization and inbound marketing strategies planned moving forward.